great product, perfect in size and has nice weight to it. Very nice quality. If classic is your style, Whitman is perfect for you. The jacquard weave is inspired from an updated paisley motif and is woven into a beautiful combination of deep navy, dusty medium blue, and a hint of silver for a touch of sheen to your bedding. The comforter and shams offer beautiful details with a 2 inches flange and 0.5 inches flat piping in silver. The reverse of the comforter is a dusty blue color. The sheets are 100-percent cotton, 200 thread count, and coordinate back perfectly to the bedding collection. Beautiful set, especially for the price. Love the comforter &amp; pillows. Everything I expected. The sheets are a little thin, not sure how they will hold up with multiple washings..... but..... I did not purchase this set for the sheets. Everything else met my expectations. 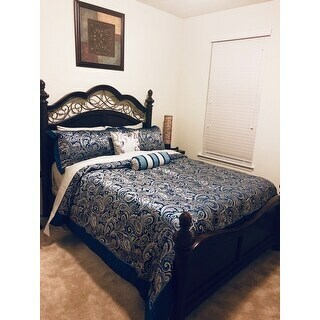 I got this for my best friend as an early Christmas present and she loves the colors, the feel and the fact that it is 12 piece complete bed set. It came quickly and was as luxurious as it says it is. Great buy! Beautiful update to our guest bedroom! The colors in the comforter and pillows that adorn the bed are gorgeous! Makes for an inviting room for guests. The colors were much richer than the photo. Believe that this is an excellent value. Will admit that the bed skirt is a wasted item for me (do not use them) but getting a set of sheets along with the decorative pillows and pillow shams is great. 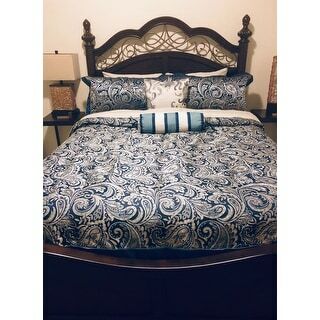 Highly recommend bed in a bag and especially this one if looking for a regal blue set. Very nice quality. A bit shiny and snags VERY easily on rings so be careful. More silver than it appears, especially in the euro shaps, which seemed more grey in the pics. Redoing my college son’s room with an eye toward making it a guest room (lol), so it’s ok. Don’t think he would have liked the shiny silver. Def worth the price. Really liked the rich blue colors of the duvet in the photos and primarily purchased for that reason. I also liked that it had a gender neutral appearance. It looked like it would work well in our master bedroom. Wow. It arrived last Thursday and I'm impressed with the quality of the duvet - and all the stuff it came with! I like the detailed piping around the duvet and the fact that it's reversible. The pillows and shams are attractive and have a nice quality feel to them. This set also came with two extra square pillow covers that require inserts, but they're also very nice! Hard to believe that the set also came with a nice blue bed skirt that matched the duvet and 100% cotton sheets. I didn't realize I'd be getting so much with the ensemble. So far, one of my favorite purchases from Overstock. This is a lovely set that really adds elegance to the master suite. However, it feels like it is made of a cheaper polyester which is very slippery, and was snagged nearly to death by the cats walking on it. Be cautious if you have pets. Rich beautiful blue, the grey is more silver in the bedding and the "grey" sheets look more like a "dinghy white" (I didn't even take them out of the bag) so I used my own white sheets to pair with it.The pattern is very busy so I fold the comforter down and added a throw to break it up. Quality is decent, there are pulls in the stitching that appear to be a manufacturing issue as they are repetative. The fabric is a shiny Poly (not a matte) that pulls very easily from the slightest hang nail, wouldnt recommend pets or even jewelry around it. I havent washed it so not sure how it will hold up, actually Ive decided that Im not going to "use" it other then decorative. Overall its a pretty set but not confident that Id recommend for everyday use, more for a guest room or if you're like me just for show... Then strip it off at night and pull out a more durable blanket for "real life" lol. Love the set. It is beyond beautiful. Only wish the sheets were deep pocket sheets. Sometimes it slides off the edges. Would definitely recommend. The bedding ensemble is beautiful. Exactly like it’s displayed in the picture and true to the royal blue color that I ordered. Other people reviewed that the stitching was off or that the comforter snags easily but I don’t have any issues. I ordered this for our guest bedroom so it will work great. Looking forward to buying some euro sized pillows to complete the look. We received compliments on this bedding set. This bedding set looked so good in our guest bedroom, along with the matching curtains. A guest wanted to know where it was purchased. I let her know, from Overstock. Nicely made, but fabric catches on your skin. Colors worked perfectly with my nautical decor. Set is very durable. Elegant bed set! Wears beautifully and color is rich and true as pictured! Love this set! The set is beautiful! The sheets are thin so I replaced them but the set looks good and the colors are true to the picture, very pleased with this purchase. "Are their curtains to match? I couldn't find any. " Yes, the matching curtains are available under item # 15478287. "What fabric is the comforter made from? Is it 100% cotton? " It's a blend of several fabrics. Not too heavy and nicely warm. I use it for the winter months and switch it out for warmer weather. Colors are very nice too. Material details are: Polyester jacquard, 8OZ/SQ YD2 polyester filling, cotton twill sheet set. "What is the thread count on the sheet set?" "Does this come in Cal King?" The Cal King size is currently out of stock. "Is this a comforter or duvet cover"
Yes, washable. I dry clean my comforters to keep the luster finish though.